After I made Big Sur Bakery’s Baked Beans, I had a problem: I had bought a whole head of celery, and used one stalk, leaving me with, well, a lot of celery. I know, I could put peanut butter on it, or even peanut butter and raisins, and try to pass it off as a healthy snack, but since the advent of the vegetable crisper – the thing that forces us to look at all that unused celery and feel guilty for not eating it when we know we should – has anyone, ever, been fooled into actually wanting to eat one? Fortunately, I ran across a blog post some time ago on The Wednesday Chef, in which she mentioned a recipe that solves the what-to-do-with-the-rest-of-the-celery dilemma, and even more fortunately, I remembered the post and was able to find it after I got tired of feeling Celery Guilt every time I opened the crisper. It took a while to find a couple of the ingredients on the list (the vinegar and the chili paste) – there were items that seemed to fit the bill at my local grocery, but since the blog post said that these two specialty items were, in fact, quite cheap, I passed on my store’s $12 vinegar and $8 chili paste, and made a special trip to our local Asian market, where I found both items for $3, and, feeling proud of my culinary bargain-hunting prowess, tossed in a package of Matcha Kit-Kats for The Child (which she loved) and then went to the liquor store next door and stocked up on Belgian beer for me (which I loved). Not only does this recipe use up leftover celery, it used up exactly what remained of my celery head, minus the one stalk I bought it for (for use in the beans). If that weren’t enough, the recipe is startlingly easy to make – startling because each time I’ve tried to make actual Chinese food at home, it either doesn’t taste as good as restaurant Chinese, or it involves complex preparations or obscure ingredients or both, and I generally end the meal wishing I’d simply gone with takeout. Though the recipe begins with two seemingly involved steps – blanching and de-stringing celery – blanching takes all of 30 seconds, and I learned a handy trick for de-stringing celery: simply run a vegetable peeler on the outside of the stalk. You might have known that one already, but I picked it up from The Kitchen Chick’s post about this recipe. 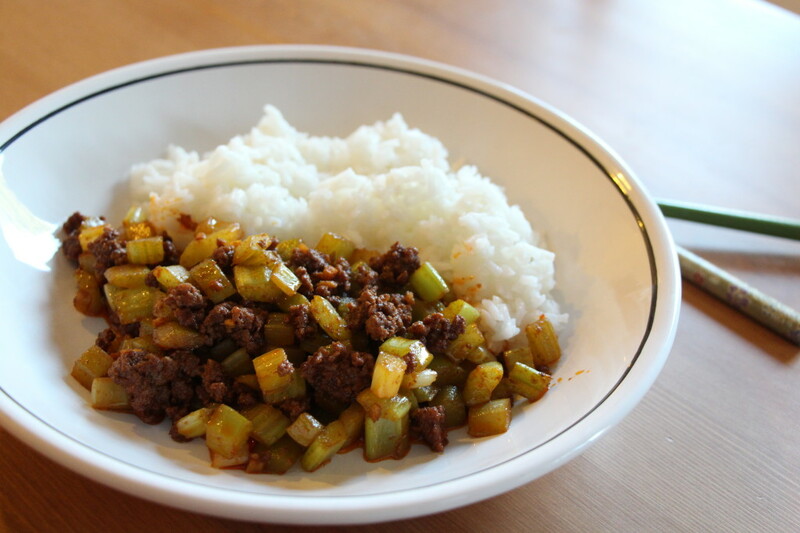 Everything else is pretty straightforward: dice the celery, cook the ground beef, and toss everything else in. Have the rice cooked (or nearly so) when you start the beef, because it all cooks up very quickly. I’m not sure I need to say it, but just in case you were in doubt: I adored this recipe. It’s quick and simple to prepare, tasty, serves two precisely. The flavors are pure, very authentic Chinese, with a nice spice that you can adjust to your taste. Did I mention The Child loved it? To my amazement, she did, even though I followed the recipe precisely and it was fairly spicy as a result. The spiciness didn’t bother her at all: She declared it was a nice spicy, not a burning spicy. The recipe is originally from Fuchsia Dunlop’s Every Grain of Rice , which is on hold for me at the library as I sit here typing. I used the directions from The Kitchen Chick’s blog post. Boil a pot of water for blanching the celery. De-string the celery by running a vegetable peeler along the outer side. Dice celery into ⅜ pieces. Blanch celery in boiling water for about 30 seconds; drain. Heat oil in a large pan or seasoned wok over high flame. Add ground meat and stir-fry until cooked. Break up pieces as needed. Add chili bean paste and stir-fry a bit more until fragrant and the oil is red. Add ginger and stir-fry for a few seconds. Add celery. Stir-fry until celery is hot but still crunchy. As you cook, season with a bit of soy sauce to taste. Stir in vinegar. This dish cooks quickly, so don't begin stir-frying until your rice has finished cooking.